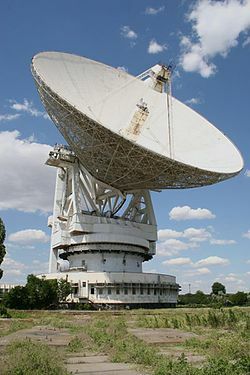 The Teen Age Message (TAM) was a series of interstellar radio transmissions sent from the Yevpatoria Planetary Radar to six solar-type stars during August–September 2001. The structure of the TAM was suggested by Alexander Zaitsev, Chief Scientist at Russia's Institute of Radio-engineering and Electronics. The message's content and target stars were selected by a group of teens from four Russian cities, who collaborated in person and via the Internet. Each transmission comprised three sections: a sounding, a live theremin concert, and digital data including images and text. TAM was humanity's fourth Active SETI broadcast and the first musical interstellar radio message. A coherent sounding signal with slow Doppler wavelength tuning to imitate transmission from the Sun's center. This signal was transmitted in order to help extraterrestrials detect the TAM and diagnose the radio propagation effect of the interstellar medium. Analog information recorded on the theremin. This electric musical instrument produces a quasi-sinusoidal signal which is easily extracted from background noise. There were seven musical compositions in the "First Theremin Concert for Extraterrestrials". Binary digital information similar to the Arecibo message, including the logotype of TAM, written greetings in Russian and English, and artistic drawings. This section and the concert program were composed by teens from different parts of Russia. According to Zaitsev, art must be central to any interstellar message. Physical laws and mathematics are almost certainly already known to extraterrestrial intelligences, but our artwork is unique to us. With this in mind, and in contrast to previous binary digital broadcasts, Zatsev proposed "not a discrete two-tone radiosignal but a more native continuous one, in which smooth frequency variations directly transfer one-dimensional emotional information. I am talking about music, which is more universally comprehensible than language, and about theremin, which is an electronic noncontact musical instrument." Three theremin performers from the Moscow Theremin Center – Lydia Kavina, Yana Aksenova, and Anton Kerchenko – were invited to perform seven songs selected by students. The program included two Russian folk songs and works by Beethoven, Vivaldi, Saint-Saëns, Rakhmaninov, and Gershwin. Kavina submitted recordings of her performance, but Aksenova and Kerchenko performed live – the radar dish had been specially modified to accept input from theremins. Each performance lasted about fifteen minutes. The First Theremin Concert for Extraterrestrials was the world's first musical Active SETI broadcast, and was sent seven years before NASA's Across the Universe message. Sonograms (frequency variations) of 40-second pieces of three musical compositions from The First Theremin Concert: (from left to right) the last movement of the 9th Symphony by Beethoven, “The Swan” by Saint-Saens, and “Summertime” by Gershwin. Single-side band (SSB) modulation was used for up-conversion of the Theremin's analog audio signals to carrier frequency 5010 MHz (6 cm wavelength) for sending toward the target stars. Photoalbum dedicated to sending interstellar Teen Age Message in August and September 2001. ^ Grinspoon, David (2007-12-12). "Who Speaks for Earth?". Seedmagazine.com. Retrieved 2012-08-21. ^ a b Zaitsev, Alexander (2002-03-18). "A Teen-Age Message to the Stars". Cplire.ru. Retrieved 2012-08-21. ^ a b Zaitsev, A.L. "Journal of Communications Technology and Electronics, Volume 53, Number 9". Journal of Communications Technology and Electronics. SpringerLink. 53: 1107–1113. doi:10.1134/S106422690809012X. Retrieved 2012-08-21. ^ a b c Zaitsev, Alexander (17 March 2002). "Design and Implementation of the 1st Theremin Concert for Aliens". Cplire.ru. Retrieved 2012-08-21. ^ a b c "The TAM (Teen-Age Message)". seti.housenet.org. Archived from the original on 27 October 2001. Retrieved 21 August 2012. 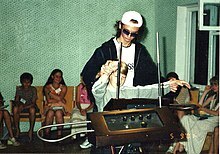 ^ a b "2001: TAM's First Theremin Concert to Space Aliens Featured Lydia Kavina". Theremin World. Retrieved 2012-08-21. ^ "How to communicate with aliens" (in Russian). pravda.ru. 9 June 2009. Retrieved 31 August 2012. ^ Highfield, Roger (1 Feb 2008). "Nasa to beam Beatles' track across space". The Telegraph. Retrieved 31 August 2012. ^ Zaitsev, A.L. (7 June 2004). "Transmission and retrieval intelligent signals in the universe". Report on the Russian astronomical conference VAK-2004 "Horizons of the Universe" (in Russian). Moscow: Institute of Radio Engineering and Electronics. Retrieved 31 August 2012. "NASA beaming Beatles tune to the stars". MSNBC. Retrieved 31 August 2012.
Cooper, Keith (3 May 2010). "SETI: Cosmic Call". Astronomy Now. Retrieved 31 August 2012. Jones, Morris (29 September 2002). "Astronomer Speaks Up For ET". Sydney: Space Daily. Retrieved 31 August 2012. This page was last edited on 3 April 2018, at 05:19 (UTC).